“Don’t Think Twice” (2016). Cast: Keegan-Michael Key, Gillian Jacobs, Mike Birbiglia, Chris Gethard, Kate Micucci, Tami Sagher, Ben Stiller, Seth Barrish, Erin Darke, Sondra James, Maggie Kemper, Kati Rediger, Steve Waltien, Emily Skeggs, Gary Richardson. Director: Mike Birbiglia. Screenplay: Mike Birbiglia. Web site. Trailer. Making one’s way in the world of improv comedy is an uphill battle to get recognized. Just ask the members of the Commune, an exceedingly talented, enthusiastic Brooklyn-based troupe that, regrettably, struggles to get by performing for small audiences. But, for Jack (Keegan-Michael Key), Samantha (Gillian Jacobs), Miles (Mike Birbiglia), Bill (Chris Gethard), Allison (Kate Micucci) and Lindsay (Tami Sagher), the hope of one day making it big keeps them going. The tightly knit group performs together like a well-oiled machine. However, when word comes down that the building housing their theater has been sold and slated for conversion, it looks like the end of the line for the Commune. With the troupe’s possible dissolution pending, the individual members begin thinking about their future, particularly getting a shot at auditioning for the cast of Weekend Live, a popular, late night network sketch comedy show. Some troupe members, like Jack, are ready for the change. Others, like Samantha, clearly have the talent but lack the self-confidence and the desire to move forward. Others still, like Miles, think they’re prepared, but are they really being honest with themselves? Then there are those who seem adrift, like Allison, Lindsay and Bill, who aren’t sure what’s next and may be ready to hang up everything once and for all. 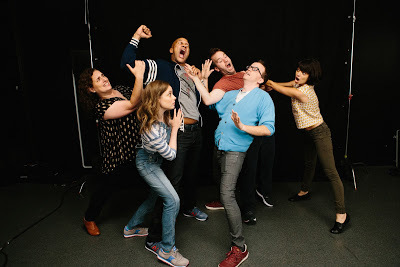 Members of the Commune improv comedy troupe (from left, Tami Sagher, Gillian Jacobs, Keegan-Michael Key, Mike Birbiglia, Chris Gethard, Kate Micucci) seek to make it big in “Don’t Think Twice.” Photo courtesy of Jon Pack/The Film Arcade. Then, of course, there are the relationships, friendships and collaborations among the group members, all of which are thrown into jeopardy with the impending changes. Can those aspects of their lives survive what is about to transpire? What will happen to them individually and collectively? Can they truly handle the success, failure and changes that loom? And, through it all, there’s the work itself. It’s what all the troupe members (like countless other improv artists) strive to master. In fact, ironically enough, improv’s core nature could even be the Commune members’ saving grace when it comes to managing their lives and careers. As the film capably illustrates, improv is all about being in the moment, unquestioningly following one’s impulses and intuition. The operative commandment here is “don’t think” (let alone “don’t think twice”), because such an approach is essential to allowing one’s best work to come out. With so many significant changes hanging over the group, maybe they should take a page from their artistic playbook to find new paths for themselves as individuals. But will they? That ability to live in the moment is crucial for anyone who practices conscious creation, the means by which we manifest the existence we experience through the power of our thoughts, beliefs and intents. As practitioners of the philosophy are well aware, the present is where the real point of power lies, for we cannot change a past that has already occurred or a future that is yet to happen. However, in the present moment, we have access to an infinite range of probabilities for materialization, all of which can be pursued based on the beliefs, thoughts and intents we employ in activating them. By recognizing this concept and how to make effective use of it, we can move in virtually any direction desired. Of course, to succeed at this, we must clearly identify the beliefs we wish to embrace, which may not be as easy as it initially sounds. For instance, if we put forth a set of mixed signals to our divine collaborator, it won’t know how to respond. Consider Samantha’s situation as an example. She contends that she’s ready for the big time, but she’s also content to continue doing what she has been all along. She also feels somewhat insecure about possessing what it takes to get ahead. So, given a jumble of contradictory beliefs like that, what do you think the chances are that she’ll hit pay dirt? Maybe if she sets those worries aside, believes in herself and goes with the flow in the moment (as she routinely does well when on stage), she might realize a very different outcome. Living in the moment also means allowing ourselves to faithfully follow our impulses and intuition. This may not seem wise in a world driven by logic and reason. Consequently, we often overlook such influences as untrustworthy and suspect. But acting upon such impressions – which may truly seem irrational and rash – could be just what we need. After all, our intuition is a major contributor to the formation of our manifesting beliefs, one that’s inherently just as vital as our intellect. Giving free rein to our impulses and intuition allows fresh, unfettered creations to come rushing forth, resulting in truly inspired outcomes. Indeed, anyone who has ever seen improv comedy done well – like that demonstrated in this film – can attest to the validity of this. In many ways, improv itself is directly in line with the spirit of one of conscious creation’s guiding principles – that there are no “mistakes” involved in it. It’s an art form fundamentally based on trying out new ideas (following unexplored lines of probability when put in conscious creation terms) to see what they turn up. Some manifestations will undoubtedly be viewed as more effective than others, but such conclusions wouldn’t be reached were it not for trying out those untried notions in the first place. In effect, this practice validates the life lesson and learning curve aspects of conscious creation, both of which are essential to our personal growth and development, not to mention the expansion of the art form. Because of this, improv created through the conscious creation process pushes limits, another chief aim of the philosophy. When those barriers are surpassed, the results can be remarkable, introducing us to entirely new types of manifestations never conceived of before. This represents the evolution of the art form, something that illustrates the conscious creation notion that everything is in a constant state of becoming. And that’s no laughing matter. 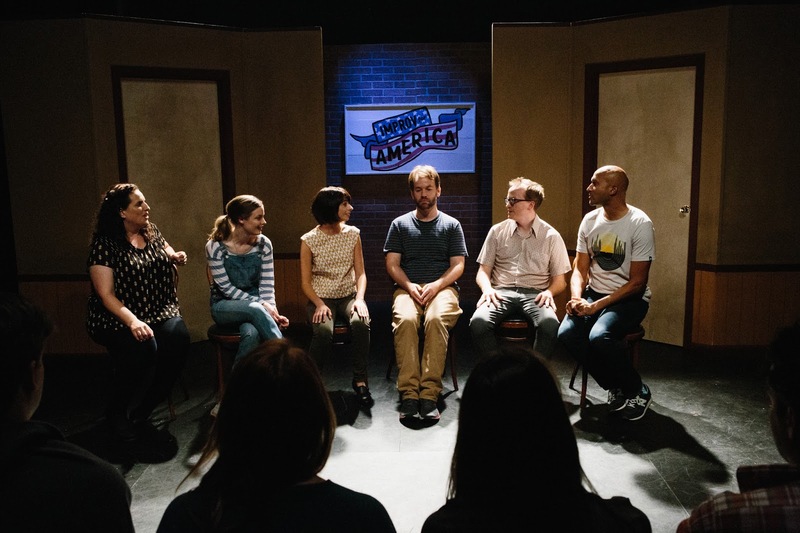 Members of the Commune improv comedy troupe (from left, Tami Sagher, Gillian Jacobs, Kate Micucci, Mike Birbiglia, Chris Gethard, Keegan-Michael Key) try out a variety of innovative routines in the hilarious new comedy, “Don’t Think Twice.” Photo courtesy of Jon Pack/The Film Arcade. “Don’t Think Twice” is a lively, funny, irreverent look at the world of improv and the struggle for that proverbial big break. From start to finish, the film feels genuine in its storyline, its humor, and its portrayal of the hopes, dreams and frustrations of making it big while remaining true to oneself, one’s peers and one’s art. It’s a sure-fire winner in virtually every regard. But its underlying messages transcend the comedy stage and are applicable to those looking to make a name for themselves, in no matter what field of endeavor. Living in the moment is often seen as an inspired approach to life. But actually practicing it may prove more challenging than simply singing its praises. However, if we intentionally make an effort to follow through on it, especially when it comes to listening to our impulses and intuition, we may surprise ourselves at the results we get.